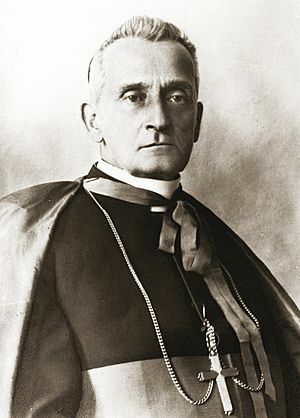 Adam Stefan Stanisław Bonfatiusz Józef Sapieha (14 May 1867 – 23 July 1951) was a Polish Roman Catholic Church priest and Cardinal. He was a mentor and patron of Pope John Paul II. Sapieha was born in 1867 in the castle of Krasiczyn. He was the youngest of the seven children of Prince Adam Stanisław Sapieha-Kodenski. Sapieha was ordained a priest in 1893. Sapieha was named Bishop of the diocese of Kraków in 1911. After the Nazi invasion of Poland, Sapieha operate the seminary in secret. Among the students was Karol Wojtyła, the future Pope John Paul II. Wojtyła lived in Sepieha's basement. In 1963, Father Wojtyła became the Auxiliary Bishop in Kraków. He was created a Cardinal in 1946. He died on 23 July 1951, at the age of 84. Cardinal Sapieha is buried in the castle of Wawel (in Kraków). Adam Stefan Sapieha Facts for Kids. Kiddle Encyclopedia.